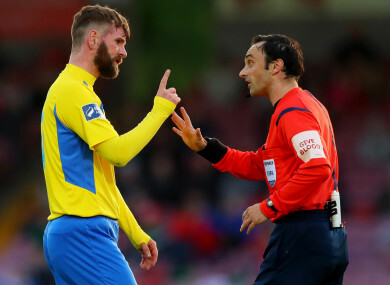 Paddy McCourt’s dismissal proved a pivotal point in the game as Finn Harps conceded twice late on. Alan Foley reports from Finn Park. “WE ARE STAYING up” sang the Galway United supporters who spent Race Week Friday scattered on the Finn Park terrace just loving their first league success on the road all season. Ronan Murray scored twice in the final 15 minutes to give Galway a massive three points against relegation rivals Finn Harps at Ballybofey after Gavan Holohan had opened the scoring and goalkeeper Conor Winn saved an Eddie Dsane spot-kick. Galway’s win means just a two-point deficit now exists to Ollie Horgan’s team, who played the last 39 minutes with 10 men with Paddy McCourt having been dismissed for picking up two yellow cards. Shane Keegan’s troops have now won three from four, as well as running Cork close in a 2-1 loss. Thirteen minutes in, the visitors went in front with a delicate dink from Holohan over Ciaran Gallagher in the Harps goal following a slide-rule pass from new loan signing from Brighton & Hove Albion’s development team, Kenyan Jonah Ayunga, who spent the first half of the season at Sligo Rovers. Former Harps netminder Winn then got down well to his left to get behind a 28th minute penalty from Dsane after Paul Sinnott had fouled the in-form Harps striker on the turn. Galway, despite the penalty concession, were the better of the teams in the first half but only went in level when Dsane powerfully headed home following an excellent breakaway and cross by Caolan McAleer in first half injury time. After the penalty, Gareth Harkin had fluffed a clearance and from close range Gallagher had to stand firm to deny Kevin Devaney with a stinging shot. And Harps got another let-off five minutes prior to the interval when McCourt had to have his wits about him to clear off the goalline from Stephen Folan after a long throw-in from Marc Ludden. But with McCourt seeing red for a second yellow card six minutes into the second half – the second caution as a consequence of a foul on Colm Horgan – it would be backs to the wall stuff for the Donegal side. Gallagher batted away a shot from Holohan and Kevin Murray’s shot was blocked by Kilian Cantwell. Murray, on 68 minutes, produced an excellent back-flick after Ludden’s cross, only for Gallagher to show top-class reactions to save. However, a top class curling free-kick from Murray in the 76th minute meant Galway were deservedly in front. Devaney then smacked the Harps post late on with a thunderous effort prior to an 83rd minute clincher from Murray on the run, tucking home at the second attempt. Finn Harps: Ciaran Gallagher; Kilian Cantwell, Packie Mailey (Ibrahim Keita 76), Ciaran Coll, Gareth Harkin (Damien Harkin 40); Caolan McAleer (Pascal Millien 86), Paddy McCourt, Ethan Boyle, Mark Timlin; Sean Houston, Eddie Dsane. Galway United: Conor Winn; Colm Horgan, Stephen Foland, Paul Sinnott, Marc Ludden; Alex Byrne (Ronan Manning 66); Kevin Devaney (Gary Shanahan 90), Gavan Holohan,Ronan Murray, David Cawley; Johan Ayunga (Eoin McCormack 90+3). Email “'The Derry Pele' sent-off as Galway rally late in Ballybofey thanks to brace from Ronan Murray ”. Feedback on “'The Derry Pele' sent-off as Galway rally late in Ballybofey thanks to brace from Ronan Murray ”.